The sales estimates for August 2009 are now online here; thanks for your patience. August with its four ship weeks managed to look a lot like July with its five, which in recession-ese means "steady as she goes" once again. The dollar value of all Marvels ordered in the Top 300 Comics and Top 300 Trades was, in fact, almost identical to July’s figure — within a couple of hundred dollars! 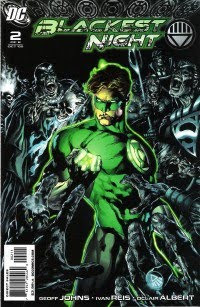 DC’s performance was very close, as well, slightly beating its July total thanks to the performance of Blackest Night. DC took four of the top 10 slots on the periodical charts. Dollar sales of the Top 300 trade paperbacks slipped again, off 16% against a very hard comparative month: Watchmen's re-release moved more than 43,000 copies in August 2008. But combined Top 300 comics and Top 300 trades were up by 1%. Basically, the top comics made up the million dollars the top trades lost. The overall figure is close to flat versus last year for the third month in a row. There continue to be many more heavily-discounted trades moving through the system this year than last; as in previous recent months, adjustments have been made to the overall estimate to retain as much of an apples-versus-apples comparison as is possible. Slightly more merchandise value at cover price entered the direct market than the $36.15 million figure indicates. While sales of a number of mainstream titles are finding new lows, in aggregate, unit sales for the Top 300 comics are comfortably ahead of where they were five years ago — and far ahead in dollar terms. Notable this month is one of the highest rankings of Archie in the direct market age, with its landmark 600th issue (and marriage storyline) landing in 35th place. Archie's overall sales are always understated by the Diamond tables, since it has significant newsstand sales; it's unclear what impact the anniversary issue will have on its newsstand draws, so it's difficult to say how many copies will be in circulation. Of course, Comichron followers know we need only go back forty years this year to find Archie as the #1 title in comics! The average comic offered in the Top 300 cost $3.45; the average comic ordered cost $3.44. The median price — the middle price of all 300 comics — was $2.99. $2.99 was also the most common price of comics appearing in the Top 300. The historical look back at Augusts past will follow in a later post. Stay tuned! It's kind of amazing to me to see that with all of the big Hollywood movies and increased book store presence and awareness over the last 10 years, we're selling exactly the same number of comic books in North America. It's pretty pathetic that this industry can't increase its audience. The only way it seems it can increase profits is to increase cover prices. (Corrected post) While I take your meaning, the fact that we're moving the same number of units (and here we're only talking periodicals) likely makes comics the single healthiest sector of magazine publishing. And that's with fewer outlets doing the selling. On top of that, though, is hundreds of millions of dollars in trade paperback sales that did not exist in 1999, in places that did not sell comics in any form back then. In those terms, the industry is well ahead in the outreach department.